Social pedagogy encourages us as practitioners to see any daily life situation as a potential learning opportunity for a child and thus to gradually nurture children’s development. For children learning itself is a hugely joyful experience, stimulating curiosity and connecting them to their physical and social environment. The Learning Zone Model, which was developed by the German adventure pedagogue Tom Senninger, is a helpful model to illustrate how we can create learning situations. In order to learn we have to explore and venture out into the unknown. We already know our immediate surroundings, which form our Comfort Zone. In the Comfort Zone things are familiar to us; we feel comfortable and don’t have to take any risks. The Comfort Zone is important, because it gives us a place to return to, to reflect and make sense of things – a safe haven. Although it is cozy to stay in our Comfort Zone, we have to leave it in order to get to know the unknown. We need to explore our Learning Zone, which lies just outside of our secure environment. Only in the Learning Zone can we grow and learn, live out our curiosity and make new discoveries, and thus slowly expand our Comfort Zone by becoming more familiar with more things. Going into our Learning Zone is a borderline experience – we feel we’re exploring the edge of our abilities, our limits, how far we dare to leave our Comfort Zone. However, beyond our Learning Zone lies our Panic Zone, wherein learning is impossible, as it is blocked by a sense of fear. Any learning connected with negative emotions is memorized in a part of the human brain that we can access only in similar emotional situations. Experiences of being in our Panic Zone are frequently traumatic, and any sense of curiosity is shut down by a need to get out of our Panic Zone. Therefore, we should aim to get close to, but not into, our Panic Zone. 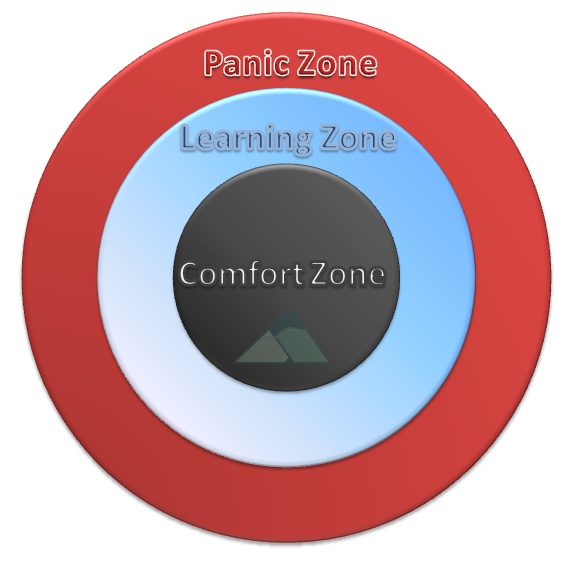 In the transition from Comfort Zone to Learning Zone we need to be careful when taking risks that we don’t go too far out of our Comfort Zone – beyond the Learning Zone – into the Panic Zone, where all our energy is used up for managing/controlling our anxiety and no energy can flow into learning. 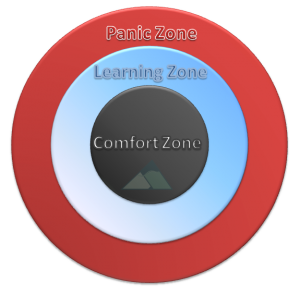 Importantly, these three zones are different for different situations and different for each person – we all have our own unique Comfort Zone, Learning Zone and Panic Zone. For example, for a child who has grown up in chaotic family circumstances, drinking out of a dirty cup might be perfectly normal and within their Comfort Zone, whereas sitting down for a meal together might be far out of their Comfort Zone to begin with – for children with different experiences this might be the other way around. Where one zone ends and the other starts is very often not as clearly visible as in the illustration above. This means that we must never push someone else into their Learning Zone, as we cannot see where one zone leads into the next. All we can do is invite others to leave their Comfort Zone, value their decision, take them seriously and give them support so they won’t enter their Panic Zone. Within social pedagogical settings the Learning Zone Model is often very useful to consider when we’re aiming to create learning situations for children. It is a simple model that can even be used when talking with children to find out how they might feel about being expected to go to a new school and to explore with them how, with the right support, this might not put them into their Panic Zone but enable them to increase their Learning Zone step by step. The following example from a residential home for children with disabilities shows how professionals can create positive experiences for children even in difficult conditions. The home had taken some of the children to the seaside promenade on a sunny day. When they walked onto the pier it turned very windy though, and one of the boys with autism began screaming his lungs out and crouched on the planks as he got overwhelmed by the sound and ferocity of the wind on the pier. When the team finally managed to get him away from the pier he was soaked in sweat and exhausted. But rather than avoiding the pier in the future the team thought about how they could gradually help the boy overcome his anxieties, so the first time they revisited the pier they only drove to the car park close to it but stayed in the car with him. The following time they opened the boy’s window a little, the next time a little more. Thus he always stayed close to his comfort zone and knew that he didn’t have to go a step beyond what he felt capable of. In small steps they got the boy to be okay with the window all the way down, with the door open, with stepping out of the car, then taking a few steps towards the pier on a later visit, until ultimately the boy was fine with stepping back onto the pier. Now the pier has very much become his comfort zone and is one of his favourite places to go to. It would have been easy to avoid the pier altogether, but most likely this would have resulted in the boy’s comfort zone shrinking even further – instead the team chose the more difficult but also more rewarding option to help the boy enter his learning zone without the fear of being pushed beyond. By being given the choice of when to go a step further and how much he felt able to challenge himself, the boy was able to expand his comfort zone slowly but steadily – and quite impressively in the end.